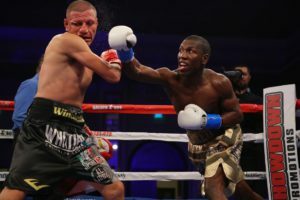 Live from the Casino del Sol in Tucson, Arizona, Golden Boy Promotions presented a handful of fights that were aired on ESPN2 and ESPN3. In the fourth round of the first televised fight, Cesar Diaz (5-0) forced Pedro Melo (17-18-2) to his knees with a body shot. Melo, however, complained of a shot to the back of the head and the referee did not give him a count. It was at this point that the excuses began for Melo. In the fifth round, he was knocked down again and before he got up started rotating his shoulder. The referee gave him his count. Melo got up and started walking around, still making a theatrical show of his injured shoulder. He had found his “out.” The referee asked if he wanted to continue. Melo shook his head. And so Diaz won by an uneventful TKO. Up next Rafael Gramajo (9-1-1) fought German Meraz (58-45-2), who was a last-minute replacement for Sergio Najera. A veteran of over a hundred fights, Meraz made this fight fun to watch. He wasn’t there just to collect a paycheck. He was there to win and to entertain the crowd while doing it. The more experienced Meraz may not have dominated, but he did control the fight. Jerky, and a bit hyperactive, Meraz even slipped once, but that did not stop the crowd from rooting for him. The fight was ruled a draw, by majority decision, but one judge had Gramajo winning. Who knows what that judge was thinking. The Hector Tanajara vs. Jesus Serrano fight was mostly uneventfully, except for an exciting fifth round exchange. Tanajara won, but not as decisively as the judges thought. Serrano was a last-minute replacement and gave Tanajara more trouble than he expected. Tanajara initially prepared to face Oscar Eduardo Quezada, and perhaps he was a bit unprepared to deal with a southpaw. The co-main event was Ryan Garcia (11-0) vs. Cesar Valenzuela (14-5-1). Garcia’s power was on full display in the first round when he knocked Valenzuela down with a sharp left hook to the head. Garcia calls himself a boxing historian and his short shorts are certainly something from another era. Garcia knocked Valenzuela down two more times before the referee stopped the fight. Garcia has the potential to become a star. He’s veritable force of nature, a kid with enviable speed and power. The main event was Jesus Soto Karass (28-12-4) vs. Juan Carlos Abreu (19-3-1). The 35-year-old Soto Karass started out slow, spending much of the first-round walking into Abreu’s hardest shots. Abreu ended the 1st round with a shot to the head that landed after the bell. In the 3rd round, there was a great exchange between both men, and Soto Karass landed a solid left hand to the head. Over the next two rounds, the flat-footed Soto Karass kept coming forward as Abreu kept skipping around. The younger Abreu looked fresh and more alive. Soto Karass slowed in the fifth. His punch count was down from previous fights. But he began to open up with his hands by the end of the sixth. Soto Karass kept up the pace into the seventh, but he continued to take punishment. Then, in the seventh round, Abreu knocked him down. Soto Karass staggered to his feet. The referee should have called off the fight then, but he let it continue. Moments later, he jumped in and called the fight off when Abreu caught Soto Karass on the ropes.